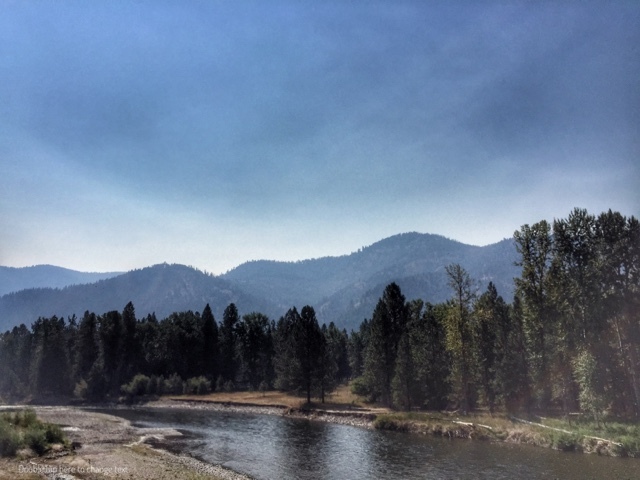 Today I'll find out where the wildfire smoke permeates within 3-hours east of Missoula, Montana, en route to near Philipsburg, Montana. So far, near Clinton, Montana, the view of mountains and even the trees just across the river are filtered through a smokey haze. Looking down the road, expectations are grim: Smoky, with the promise of worsening air quality. 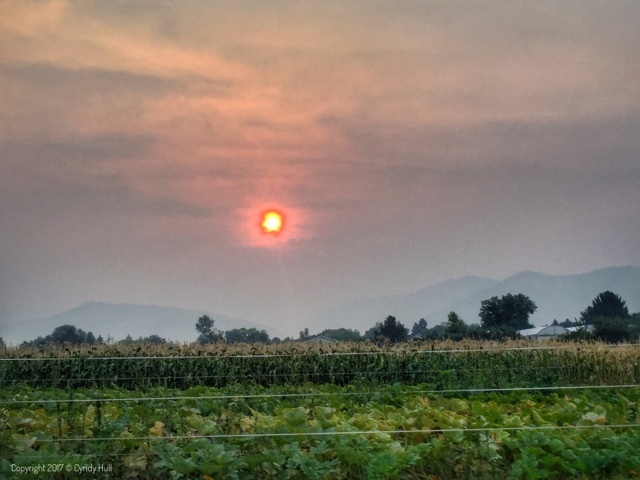 Smoke still ringing our valley brought to mind Glenn Kaiser's bluesy song "We are surrounded...by the witness cloud..."
The good news: The corn & cabbages at Benson's Farm still seem to be growing just fine! 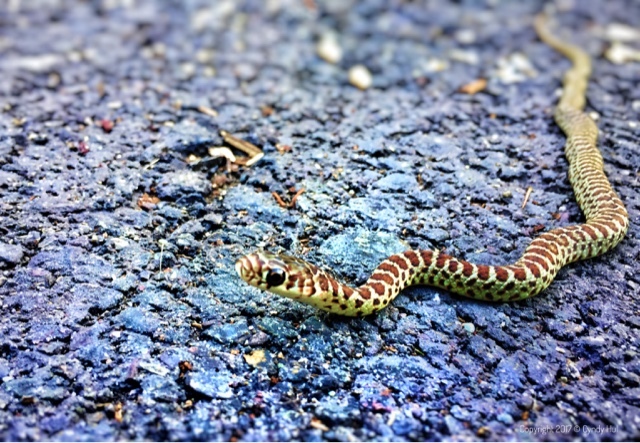 Spying this dandy little snake along our walking trail instantly flashed me back to another day about 20 years ago on a trail rife with tree root crannies, when a dear nephew excitedly whisper-yelled, "Auntie! Don't move!" The same dear boy, at an educational classroom event, volunteered his mum who was 'not afraid to hold the snake' - this one giant-sized and showcased by a professional handler. And - bravo! - Mum did not disappoint! Ah, the joys of loving fearless boys! Thursday morning - same time, same location - featured noticeably clearer views of the mountains west of Missoula, Montana. 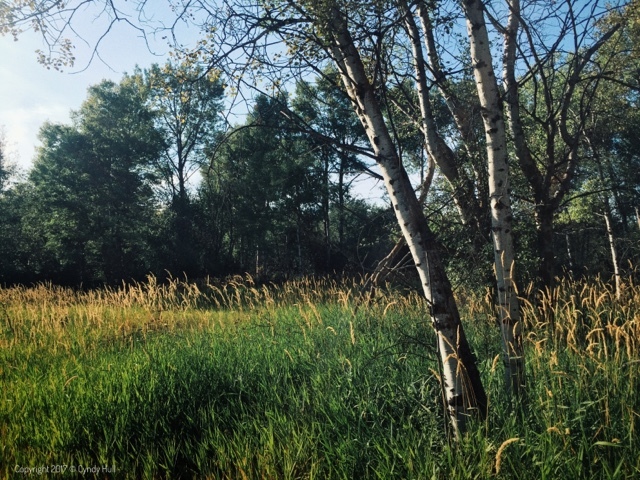 The promise of rain provided enough humidity shift to damp down some fire activity, and afternoon showers provided a few days of respite from weeks of wildfire smoke. 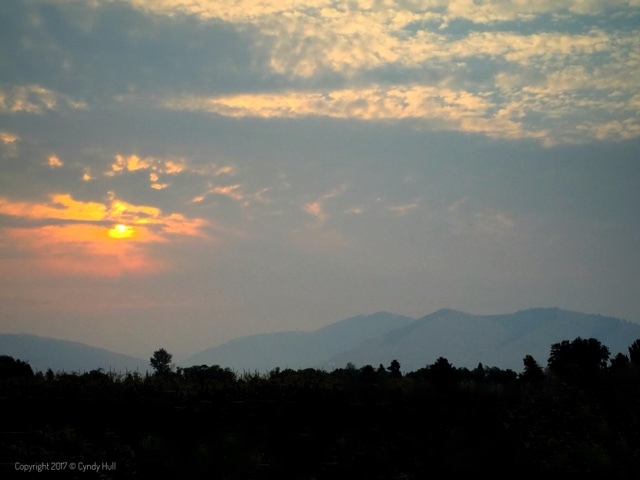 Last week was particularly distressing on the wildfire front, with many folks above Lolo, Montana, either evacuated from their homes or under alert to leave at a moment's notiice. 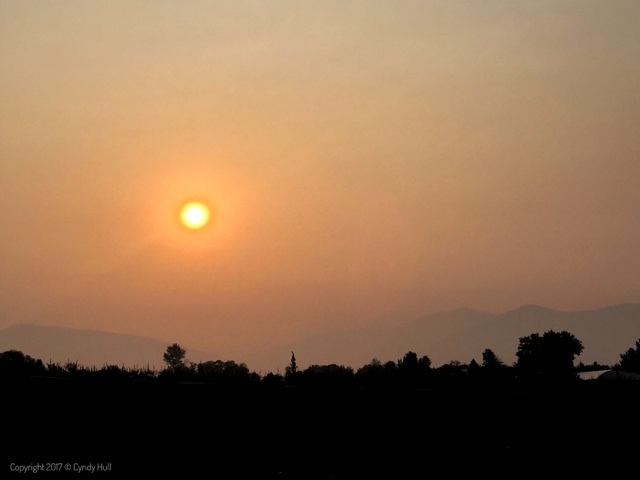 Due to Missoula's locale at the geographic convergence of five mountain ranges, smoke filters into the Missoula valley from multiple fire sources. Wednesday morning's commute traffic stopped at just the right spot to allow this view across Benson's Farm to the hazey outlines of Missoula's westward mountains.